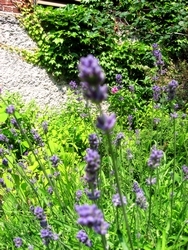 Lavender is best known as a nervine relaxant and nervine tonic. It has been used throughout the ages to help manage stress, support grief or help unwind after a long day. I’m just getting back from a wonderful March Break in San Francisco where lavender hedges and bushes greeted us wherever we roamed. I’ve been told that lavender is often planted along the border of a garden or yard so that as you brush against the foliage you benefit from the relaxing aroma it releases. My walk along upper Melrose allowed me to inhale the essence of lavender daily last semester… a great way to start and end each day. I like to gently rub my fingers or palms through the leaves so I can deeply inhale the wonderful fragrance that radiates off my hands. Lavender’s scent alone is said to be nerve soothing, anti-depressing, and pain-relieving. Dried lavender flowers can be enjoyed as a calming tea for insomnia and excessive worry, or to bring courage and strength to women preparing for childbirth. It is also used in antidepressant preparations. The next time you’re feeling blue or stressed take the time to sip a cup of lavender tea as you soak in an aromatic lavender bath! Or macerate lavender flowers in olive oil and use the oil externally to massage tight, overused, knotted muscles. 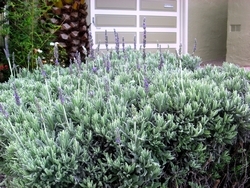 Rosemary Gladstar suggests soaking a cloth in lavender infusion and applying it to relieve headaches. Rosemary has a couple wonderful recipes for relaxing herbal baths and footbaths in her book Herbs for Reducing Stress & Anxiety (see below). Dried lavender flowers are frequently used to fill “dream pillows”, sometimes alone but often along with dried chamomile flowers or hops. I stuff miniature pillows (small enough to hold in your palm) with dried lavender flowers and sew them up into “pocket pillows”. Then anytime you want or need a calming lift, along with an extra deep breath, pull out the lavender pillow and inhale it...fully! I’ve also made larger pillows to slide under pillow cases for nights when you can’t get (back) to sleep. Try hanging a bundle of lavender from your headboard to bring tranquility and a good night’s rest. On a separate note, lavender sachets can be tucked into armoires and drawers to repel moths... more pleasurable than mothballs in every way! Essential oil of lavender is another frequently used preparation to calm frazzled nerves or console the grieving. Essential oils are made by distilling the plant (many, many plants actually) into a concentrated form… a process that’s difficult to replicate at home. The only lavender essential oil produced in Canada is from Bleu Lavande in the Eastern Townships, a lovely farm and distillery that’s been operating since 1998. I keep a bottle of essential lavender oil in my first-aid kit for topical relief or as aromatherapy. It can be used to relieve the pain of wasp stings, mosquito bites or toothache. Try adding a few drops of lavender essential oil to a hot bath to help you relax or massage it into your temples to alleviate a headache. It can also be used for its antiseptic, antibacterial and immune stimulating properties. Add it to your humidifier for lingering coughs, pneumonia and lung infections. To make an effective mosquito repellant I mix equal parts (about twenty drops) of lavender, citronella and eucalyptus essential oils into a quarter cup of olive oil. If it’s black fly season, I add essential oil of penny royal to the glass jar. Applied frequently, it is very effective! Lavender is part of the lamiaceae (labiatae) family, along with mint, basil and oregano. As most members of the mint family, lavender is aromatic and acts as a digestive tonic having carminative and chologogue actions. Dried lavender flowers can be sprinkled into your shortbread or pound cake recipes or used as a savory herb, along with sage and rosemary, on roasts or poultry. To enhance digestion it’s most commonly sipped as a tea after meals. Lavender loves bright sunny locations, especially a hillside which faces south, and can survive without much extra water once its roots are established. 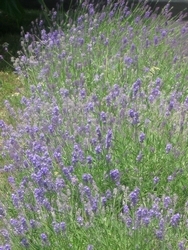 Lavender does not grow wild in North America and it’s most successfully started from a small plant. 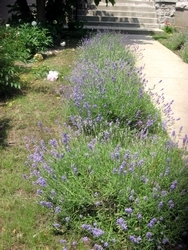 Once lavender gets to a “woody” stage, it can over winter in zone 5 and warmer, although protecting it with branches or mulch is often advised. 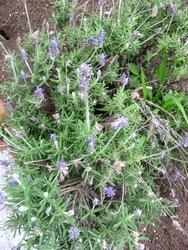 Last year lavender flowered throughout the summer and continued to offer her calming bouquet until early December when the first snow blanketed Montreal. As I toured Westmount and surrounding neighbourhoods with my Phys. Ed. classes in the fall we would often stop to identify the abundant lavender, and enjoy a relaxing sniff. As I see last year’s growth surfacing from the snow I look forward to spring, to green abundance and, as Liddy’s Spring Equinox Fire Ceremony encouraged, to living life with more joy, passion and purpose! Over the years I have been blessed with many Wise Woman teachers. I thank them for sharing their wisdom through their lectures, workshops, websites and books. For more information about lavender and many other herbs, enjoy these insightful and informative resources.